Did you realize that Abraham's brother Nahor contributed just as much to the Jewish gene pool as Abraham did? In fact, each of the four known children of Terah were a significant part of Israel's ancestry. I've inserted Judah's name here to represent each of Leah's children. I could have used Rachel and her sons, and it would have been the same. The percentages would be a little different for the sons of Bilhah and Zilpah because we'd have to take Laban out of the picture. 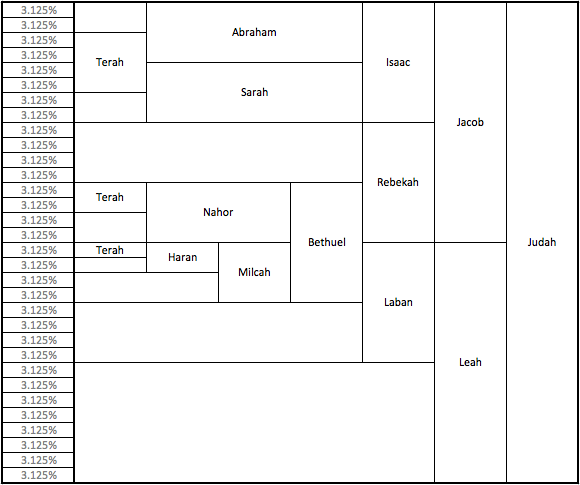 To calculate the percentage of an ancestor's contribution to Judah's genealogy, add up all the units in the left column that apply to that person's name entry. For example, Abraham contributed 12.5% whereas Bethuel surprisingly contributed 25%.